This C20-to-C13 power cable features 14 AWG wire suitable for high power connections, making it a reliable solution for large server applications that require a higher-rated, heavier-gauge cable. This IEC C20-to-C13 cord can be used to connect a computer, server, monitor or drive to a UPS system or PDU or replace or upgrade the standard power cord provided by the device's manufacturer. The seven-foot length allows you flexibility in placing equipment with respect to the power outlet. What's Included P032-007 7ft Standard Power Cord; C13 to C20 Power Cable, 7 ft.
Tripp Lite’s P032-007 7-foot, Heavy-Duty Power Cord is the ideal power connection solution for high-output computers, servers and other network devices to PDUs with a C19 power outlet or connecting other compatible electronics that require heavier-gauge cabling. 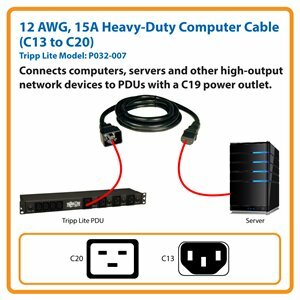 With a C13 connector on one end and a C20 connector on the other end, this 12 AWG, 15A cable connects a device with a C14 power inlet to a PDU, UPS or other compatible AC source. Unlike cut-price power cords, the P032-007 is manufactured using superior materials and is UL-listed for optimal product safety. The high-quality molded connectors are designed for reliable service and long life. This SJTW cable has three 12 AWG conductors and is rated at 15A for cooler operation. For peace of mind, the P032-007 comes backed by a lifetime warranty. As part of Tripp Lite’s commitment to environmental responsibility, the P032-007 minimizes the use of hazardous materials and meets strict RoHS specifications.